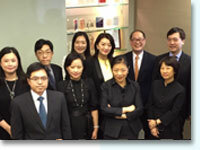 The Corporate and Commercial team at Woo, Kwan, Lee & Lo has been active in Hong Kong since the 1970s. From 1991, our team has assisted over 130 companies in their initial public offerings (IPO) on the Hong Kong Stock Exchange, acting for the underwriters or companies seeking a listing. Our clients are principally blue-chip, red-chip and other public and private companies in Hong Kong SAR, and state-owned and private enterprises from Mainland China, with business interests in industries, real estate, infrastructure, banking, finance, servicing and retailing. Our experience in listing projects has earned us a reputation as one of the leading Hong Kong law firms with expertise in this area and in-depth experience in Hong Kong and Mainland China transactions. The Corporate and Commercial team also advises clients on mergers and acquisitions, equity and debt capital market transactions and other corporate finance matters, sale and purchase of companies and businesses, joint ventures, property development projects, intellectual property, tax planning and tax appeals and trusts. A 'one-stop shop' package of company secretarial service is also provided by our secretarial company, Fair Wind Company Secretarial Services Limited. We believe that expertise and experience guarantee quality service, but more importantly, people with strong commercial experience play an important part in helping clients to map out business strategies and address problematic issues. We have over 30 lawyers including 4 Mainland executives who are PRC qualified lawyers, 4 company secretarial professionals and 60 supporting staff attending to client's needs. Most of our team members are Chinese and conversant with Putonghua thus giving us an edge in servicing Chinese clients especially those with business interest or intend to expand their business in Mainland China.